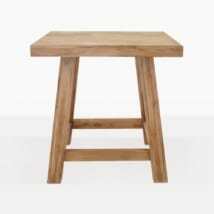 Looking for a classic teak bar table to sit at and unwind after a long day? Relish the simplicity of the 35” Square Bar Table, this divine, stylish and stable piece for your outdoor area will allow you to enjoy long hours of relaxation. Elegant and sturdy at a substantial 35 inches squared, this classic teak bar table is available with an umbrella hole to enable you to have shade during hot summer days. Elevated to suit a space with a view or to create an outdoor bar area, the Square Bar Table will make an excellent addition to your home. 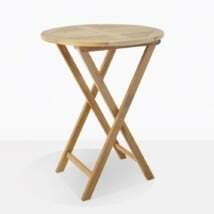 W35" x L35" x H43"
This classic teak bar table is made from only the best materials. At Teak Warehouse, we are renowned for using A-Grade Teak in our wood products, meaning that you are receiving the creme de la creme of quality furniture for outdoors. Enjoy the soft finish on these expertly finished pieces of furniture. Our A-Grade Teak showcases the natural beauty of the wood, each item with its own unique grain within the wood. While the wood will patina to an attractive silver over time, the honey color will remain beneath the surface – proving strength of the wood because of the natural rubber and oil content running through the product and giving you extra flexibility when it comes to the look of your piece. All you have to do is sand back your furniture to reveal the warm honey tones! We use only marine suitable fixtures and fittings, so you can rest easy knowing that these are low maintenance and long lasting pieces of outdoor furniture. 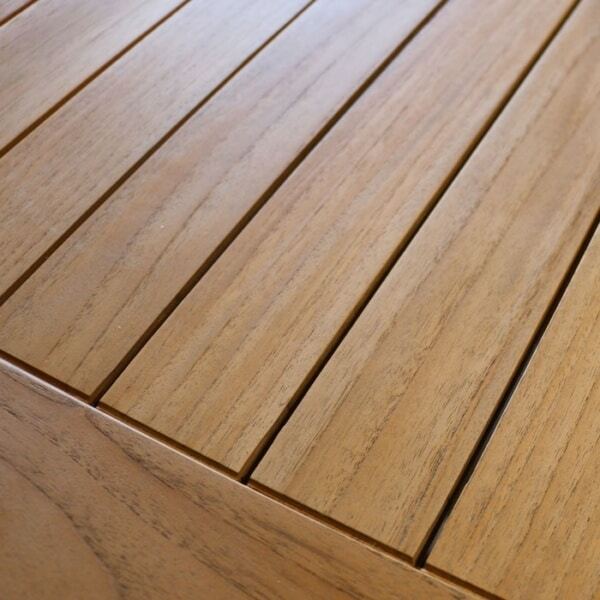 Teak Warehouse can cater to what you need for your outdoor furniture setting. 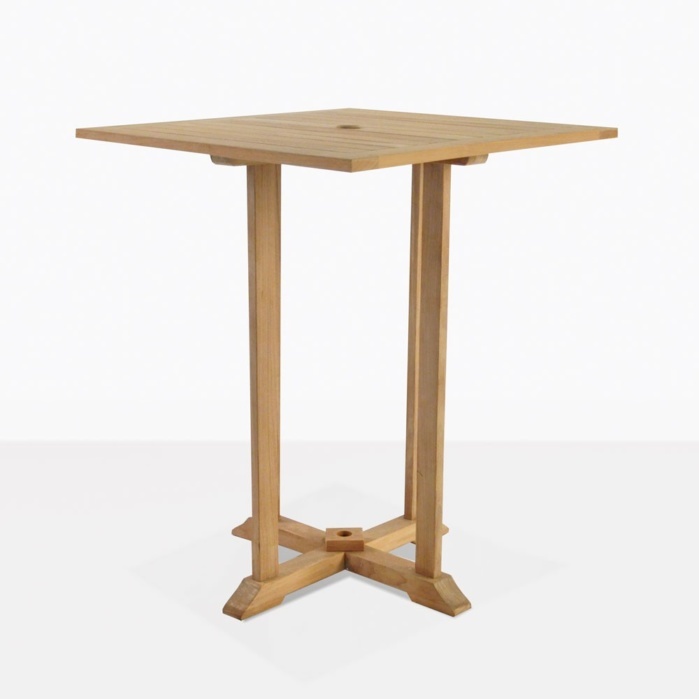 Create a perfect bar set up with this classic teak bar table with any of our great range of complementary seating. Choose from wicker or A-Grade Teak, depending on whether you want modern or more traditional. 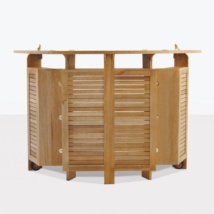 We also have a terrific collection of storage and bar units that make outdoor dining a breeze! 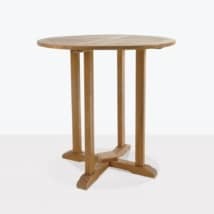 Pair the 35” Square Bar Table up with a corresponding teak bar stool, available with or without arms, for a comfortable, relaxing area to sup on your favourite tipple with friends. Situate against a shaded, leafy garden wall and relish in the opportunity to dine in splendor in the comfort of your home. This classic teak bar table is also an ideal choice for commercial outdoor areas. Fill up your restaurants courtyard with the 35” Square Bar Table and add a wicker bar stool to invoke a welcoming, warm and stunning area that your patrons will adore! Whatever you choose; the 35” Square Bar Table is a fail safe choice for those who want a bar table that is simple, stable and stylish. This triumphant classic teak bar table is available and in store now, ready to be shipped to your door!